Tom Yum paste is meant to be the flavoring for Tom Yum soup, but it is also simply delicious as a marinade. It works wonders with all types of chicken, fish, and seafood as well as pork. Just slather on this flavor-popping paste, then either bake, pan-fry, or grill for a dish that sings with authentic Thai taste! The paste is easy to make—just whip it up in your mini food chopper or food processor. 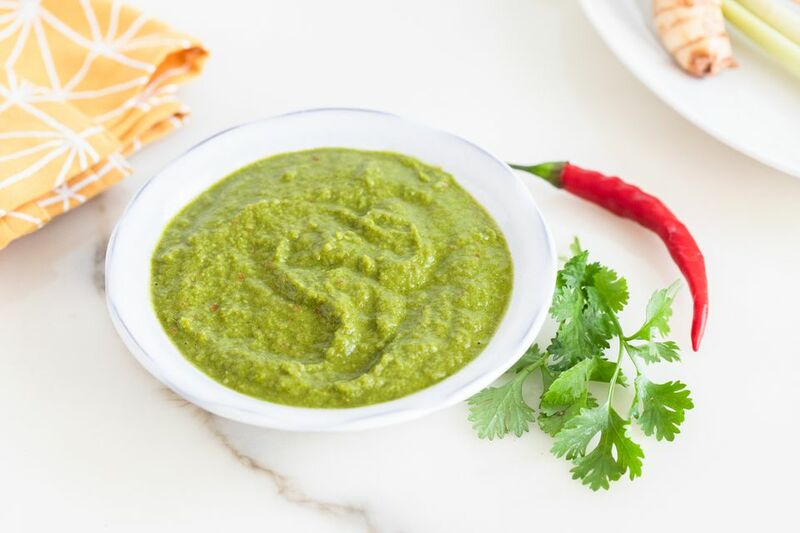 It's healthier than store-bought Thai pastes or marinades and tastes ten times better. Place all ingredients in a mini food chopper or food processor. Blend to create a fragrant Tom Yum spice paste. Use in Tom Yom soup or as a marinade and enjoy! This paste is excellent over fish fillets or steaks, shrimp and other shellfish, or chicken or pork pieces before grilling. With fish and seafood, there is no need to marinate (the lime juice will actually begin to cook the fish and seafood)—just slather the paste over and cook right away. If cooking for two, use only half the paste as a marinade and save the rest to make a delicious side sauce. Place half the paste in a small saucepan. Add 3 to 4 tablespoons coconut milk or fresh cream. Stir as you bring the sauce to a light simmer (avoid boiling, or you will lose the fresh flavor of this sauce). Drizzle over your entree, or serve on the side. Equally delicious over rice or new potatoes. To use this paste for soup, bring a pot of good-quality chicken stock to a boil. Add spice paste a few tablespoons at a time, taste-testing as you go, until you're happy with the flavor and spice level. Add more fish sauce instead of salt as needed. Add shrimp or tofu, plus desired vegetables. Coconut milk can be added for a creamier soup.